This poetic children’s book is a wonderful addition to bringing Emily Dickinson to young people. In this case, the book is not about her poems but about her playful nature with children. Interestingly, while the plot is fictitious, it is based on a true book by a childhood neighbor of hers. We read the book from the first person view of that authentic neighbor, and imagine it all happening just as told. One of the marks of a good children’s book is that it inspires one to read more. 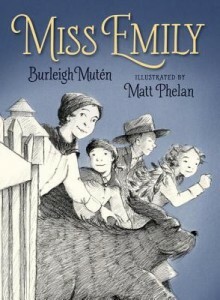 In this case, the book led me to research more biographies about Emily Dickinson, as well as find children’s books of poetry by her. I think that the value in this book lies more in that than in the particular story itself. This is a very simple book, excellent for reading aloud, or for early readers about age 7. It has an interesting moral in it, that for me resembles the moral from the age that Emily lived, rather than today. However, it would make a great conversation – do the actions of children reflect back on their parents? This is not often raised in a children’s book, and it gives this book a very old fashioned flavor. This is also a great piece of historical fiction, as it is clearly set in Emily Dickinson’s day of the late 1800’s. In that respect it’s also an educational book, though some of that might go over the heads of the younger children.